These Farm Heroes level 446 cheats and tips will help you beat level 446 of Farm Heroes. 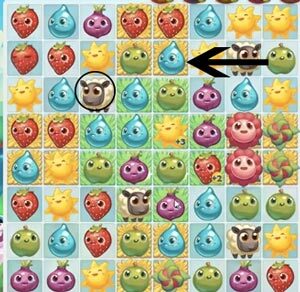 The objective of Farm Heroes level 446 is to 100% growth in 22 moves by collecting 4 sheep, 16 flowers, 64 suns, and 64 strawberries. Farm Heroes Saga level 446 will require you to grow and collect a whopping 16 flowers. Because your flowers are on the yellow stacks of hay, you should look to bloom them first. If a flower is occupying a stack of hay, you can not collect a sheep. In order to grow a flower you will need to make three adjacent matches alongside of your flowers. Remember, the best way to conserve your moves is to work as efficiently as possible. Because your flowers are next to each other, you should have absolutely not problem blooming several at once. You will also need to make all of your adjacent matches count towards your required cropsies of red strawberries and yellow suns. Farm Heroes Saga level 446 also requires you to herd along a total of 4 sheep. 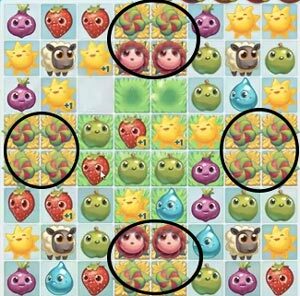 Herding sheep in Farm Heroes Saga will take up a great amount of time, so it is best that you plan accordingly and give yourself an ample amount of moves. To collect a sheep, you must move them to a yellow stack of hay. Luckily, you will have 16 squares of it spread across the board. To move a sheep, you must make an adjacent match alongside the sheep. The sheep will then hop to the square where the match was finished. This process will need to be repeated until your sheep hops onto a stack of yellow hay. Therefore, your finishing match should always be on a stack of yellow hay. To make this process more efficient, make the matches count towards you required cropsies of yellow suns and red strawberries. Level 446 Cheat #3: Count on your shovel boosters. If you find yourself struggling, don’t be afraid to call upon your faithful booters. 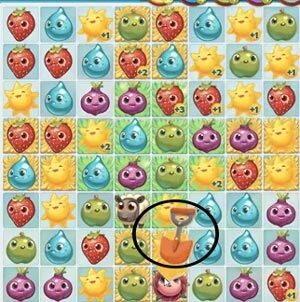 One of the best boosters you can use in Farm Heroes Saga level 446 is the shovel booster. The shovel booster will remove any cropsie or object in your way of making a match. It will also help you in growing a flower by one entire step. But lets not forget, in addition to be useful the shovel is also efficient because it will not use up any of your moves.